But, though, this child was interested - labeled everything accurately - he never played.. Suddenly now when his Dad takes him to the Mall on Fridays for their lunch date - instead of running to the Apple Store - he now pulls him to the kiosk with the stuffed toys. He has been eagerly choosing a Wonder Pet and then a Backyardigan each time. Then he started taking them places. I watched with my eyes filling with tears of joy as he put Linny, Tuck and Ming Ming turn by turn to get their drink as well ! "I believe L will do everything , but in her own time. I dont mind .. she can take all the time she needs .. but I have faith she will do it all." Last night as R took Tuck with him to read a book in his pre bedtime swing, I thought of Jos's words again and wondered how freeing it would be if I just assumed that it would all turn out all right. Had faith that R would do it all- eventually. Because time and again it seems that R is on his own timetable. But is also in his own way, developing beautifully. And take your toxic friend Fear with you too ! What a precious picture of him and his little buddies! I'm SO excited that he's entered this stage!!! I love watching kiddos pretend play, especially when they're just beginning! And to see R begin pretending is totally awesome!! This brings tears to my eyes. I am so very happy for R (and you and A of course). I know this was a struggle for him--what a joy to see him enjoying something so wonderful and fun! Why is it so hard to get rid of the worry and fear....and for me forget the milestone charts!! Their way, on their time...right?! Yjis brought tears of joy to my eyes and hope to my heart for my own son's development. How is it that I often find the message I need when I visit your blog? Thank you, Kajoli. And thank you, Universe. Words we all should live by! Beautiful post! Your little guy is one lucky boy to have a mommy like you...Thank you for sharing...The picture is the sweetest! I squealed and got all goose-bumpy while reading this. You and he are blessings to one another and to us. You teach me so much and help me keep proper perspective each time you share your heart and son. The photo is precious. He is a handsome guy. hahaha! No worries for sure! I love his chair. Another miracle!!! I bought every toy in the world too. All my little guy wanted to do was to be outside. I am so happy today because of your posts. I love reading things from your perspective as well. Thank you! incredible story and great picture ! I love it! How awesome for R, and for you and dh, that is huge :). Wish I was there to give you a big hug! I love that perspective too - all in their own time. I believe that too, we've experienced it with so many things with our boys. Thanks for stopping by my blog. 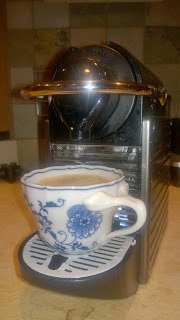 I am a fan of their Italian and Espresso Forte but like all their coffees. Re: your post -- wow, I am so happy for you both!! We went through this with James and just this year he is starting to pretend play with a tea set and trains. He is beginning to play with a stuffed giraffe and his Rocket ship and he "reads" books to us. You have a very wise friend. And a very beautiful and happy boy. I am so thankful for a friend like you and so desperately wish we lived closer. And I really and truly believe you need to write a book. I second what Jos said. Write a book. I'll buy a zillion copies!! What a wonderful post...and I think your friend is right. We need to keep the faith that our kids will do everything...eventually. How exciting about the pretend play!! "how freeing it would be if I just assumed that it would all turn out all right." I think I am going to put this up on my bathroom mirror to look at daily. Lovely.